MyMemories Blog: Meet this week's Featured Designer! It's *Magical Reality Designs*! Meet this week's Featured Designer! It's *Magical Reality Designs*! Good morning and Happy Monday!! I hope you all had a wonderful (i)National Scrapbooking Day (weekend!!) and got lots of goodies off your wish lists! We love to celebrate another of our amazing MyMemories Designers each week here on the MyMemories blog! This week we are pleased to feature one of our long-time favorites! It's Katherine from *Magical Reality Designs*! 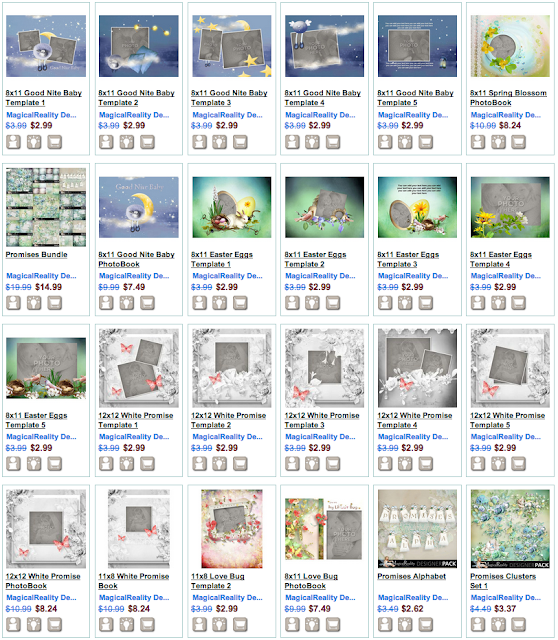 Katherine has been with MyMemories for quite a while and has a HUGE selection of beautiful goodies in her shop! My name is Katherine aka MagicalReality Designs. I am a 33 year old Libra, a mother of 2 precious angles, and a wife for 14 years and a mommy to my beautiful 2 year old German Shepherd "Codey". I am extremely in love with photography, digital graphics and painting. I have been a designer since 2007. My main style of designing is Fantasy, but I do offer little bit of everything. Capture the moment and share the magic with MagicalReality Designs! So take a peek at her designs and come back and tell her YOUR favorite!! This week FIVE Lucky winners will each receive a $20.00 shopping code to her store!! Enter today! I love love love the Love Bug Bundle! Baby boo is absolutely adorable. I also am a sucker for roses ... I like the Vintage Love. I love the realistic designs. Beautiful work! There is absolutely no way I could pick a favorite from your collection. I love them all, I can't stop adding them to my wish list :) I already have several of yours. For my next project with your collections I love the Angel of Mine as well as Do You Believe in Magic. Then I'll get started on the mothers day ones this weekend. Thanks for the chance to win! It is difficult to pick just one favorite from that fabulous kits. But my first favorite is Toetally Faerie Pack. Thanks for the chance! I love all her gorgeous kits - nearly impossible to pick just one, but I know I don't have her promises bundle yet. thanks so much for the chance! Everything is gorgeous, but if I have to choose Promisses is one of my favorites! It is impossible to pick a favorite since I love all of Magical Reality's designs. Seriously, I would love to have them all. Beautiful designs my favorite is the Peaceful Winter Designs. Hi, I keep checking back to find out who the 5 lucky winners of the $20 shopping code to Magical Reality designs were! Have they been chosen yet? Thank you! That could have run 15,000 words long and remained captivating. What a fascinating subject and fantastic piece. You are to be congratulated.